First Generation Farmers (FGF) is a working demonstration farm and farmer incubator nonprofit located in Brentwood, just east of Discovery Bay. Twenty-six year-old Christian Olesen and his business partner Alli Cecchini farm thirteen acres they acquired from Alli’s parents, Bob and Barbara Cecchini. The Cecchinis previously grew asparagus on the acreage, which has been in agriculture since 1864. Currently, Christian and Alli are in the process of transitioning to certified organic agriculture, using practices geared towards conserving and enhancing natural resources. FGF strives to facilitate food access for the local community while educating both consumers and beginning farmers through hands-on learning and farm exposure. FGF also operates a nearby educational campus on thirty-five acres comprised of mini demonstration sites on topics such as biodynamic processes, vermi-composting, edible landscapes, rainwater collection, habitat restoration, and land conservation. The campus also houses a California native pollinator garden, a classroom, and the farm’s washing, packing and refrigeration facilities. Last year, Christian and Alli planted a small permaculture orchard. 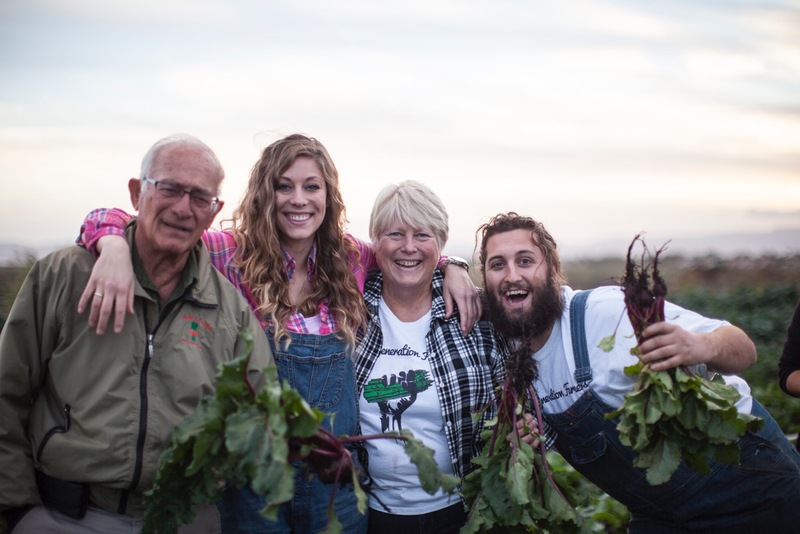 All of the produce grown on the farm is sold via a donation-based retail model. The main crops are brassicas, beets, asparagus, kale, nightshades, and cucurbits. They also have goats, sheep, free-range chickens and beehives. FGF products can be found at their farm stand and at East Bay restaurants and farmers’ markets. Each year the operation has been growing while increasing on-farm conservation activities. Christian started out farming a half-acre in 2013 and he expanded to five acres in 2014; in 2015 FGF grew to twelve acres. Recently the Cecchinis decided to establish conservation easement on their 1,100 acres with help from the Brentwood Land Trust. The Sacramento-San Joaquin River Delta, where FGF is located, is known for hot, dry summers, cool wet winters that can cause flooding, and a high water table. At First Generation Farm, even irrigation has been an ongoing challenge. At times, one part of a row would be flooded and the other side would be completely dry. 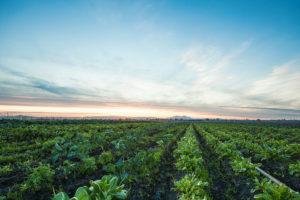 The Cecchinis had previously flood-irrigated, but Christian wanted to shift to sprinkler and drip irrigation to conserve water and maximize water efficiency. When a water table is high, balancing soil moisture content is important to prevent over-irrigation. Increased soil organic matter improves the water holding capacity of a soil and thus requires less irrigation. FGF received a Natural Resources Conservation Service (NRCS) Environmental Quality Incentives Program (EQIP) grant to purchase seed for planting Sonoran wheat as a cover crop to help protect the soil from erosion and preserve soil organic matter. Christian and Alli also planted purple vetch and rye. Plastic mulching atop semi permanent beds helps minimize irrigation and conserve the water supply while optimizing soil water balance. Selecting crops for seasonality also helps maintain soil moisture levels and reduce irrigation needs. FGF’s water source is a pipe that siphons water from the Delta and brings it to an irrigation canal. Christian and Alli used an intermediary sprinkler irrigation system for one year, but have now converted to an all-drip system. During that year, they constructed their filter system and worked with Precision Irrigation West to design a drip system that includes running a four-inch main line the entire length of field. Balancing soil moisture and reducing their dependency on Delta water has involved going from furrow irrigation to sprinklers, and then finally to drip irrigation. Sprinkler irrigation proved to be inefficient, but Christian discovered that he wouldn’t be able to take full advantage of the Delta water source and convert to drip irrigation without a filter system because of sediment in the water. Installing the new irrigation and water filtration system was a time consuming and expensive long-term investment. Christian worked with the NRCS to design a new irrigation system that draws irrigation water from the Delta and filters it before it reaches the field. Sand filters remove the sediment and particulate matter that could potentially clog the drip emitters. Valve controls were placed at the beginning, end and middle of each row; shutting down the valve half-way down the field allowed for more exact watering if a portion of the field was too wet or too dry. By burying the drip tape four inches deep and covering it with plastic mulch, Alli and Christian have minimized evapotranspiration. NRCS also provided funding for 600 feet of native hedgerows. Christian and Alli installed habitat ditches to attract birds and beneficial insects, but they also serve as wind capture areas to mitigate the effects of wind erosion on the topsoil. NRCS worked with FGF to install owl boxes and raptor perches. Surrounding acreage provides habitat for ducks, sandhill cranes, Swainson’s hawks, songbirds and egrets. With this new system, Christian found that he had a lot more control over the quantity and flow of water. Today the irrigation system is 35 percent more efficient than the flood irrigation system. Combined with cover cropping, this has enabled FGF to produce larger yields using less water by keeping moisture in the soil. The drip system also helped reduce weed pressure.